Primitive Americana Patriotic Red White and Blue Star Bowl Fillers Set of 3. What a fantastic way to show your patriotism. 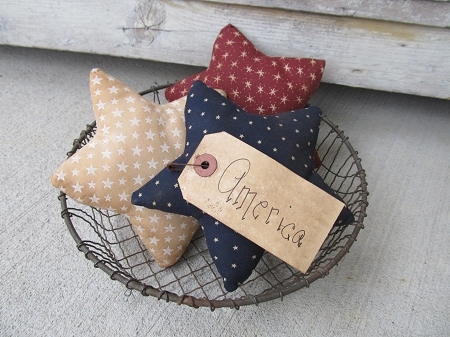 Stuffed stars are perfect for bowls, trays, crocks, baskets and more! Set of 3 stars will include one of each color, red, white and blue. Fabrics may vary slightly. Container NOT INCLUDED. Sizes are 7"x6" each star. The set also comes with a primitive tag for display, sayings vary. Handmade by Lynn.